PUTRAJAYA - The Department of Land Management, Faculty of Agriculture, Universiti Putra Malaysia (UPM) in collaboration with the Malaysian Society of Soil Science (MSSS), Department of Agriculture Malaysia (DOA) and Malaysian Agricultural Research and Development Institute (MARDI) held The 10th International Symposium on Plant-Soil Interactions at Low pH (10th PSILPH 2018) here, recently. 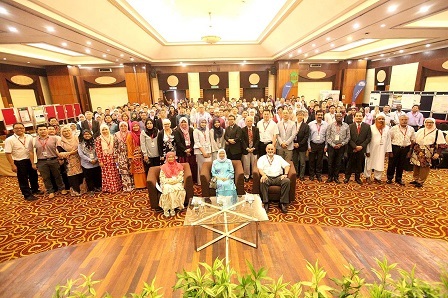 The triennial symposium with the theme, ‘Achieving Sustainable Agriculture Production on Acid Soils’ was officiated by UPM Vice-Chancellor, Prof. Datin Paduka Dato' Dr. Aini Ideris, who also launched several books published by UPM publishers. This time, UPM was chosen as the host. The symposium focused on ways to increase agricultural yields on problematic soil such as acidic soil. Although there are many modern techniques such as hydroponic, aeroponics and aquaponics, land cultivation remains a priority to cater for world food supply needs. In addition, the interaction between plant and soil itself is unique and complex. Plants get the necessary supports and nutrients from the soil while microorganisms in the soil require food sources from plants. Keynotes speeches of the symposium were presented by Prof. Dr. Leon V. Kochian (Global Institute for Food Security, University of Saskatchewan, Canada), Prof. Emeritus Dr. Lynette K. Abbott (University of Western Australia, Australia), Prof. Dr. Toru Fujiwara (University of Tokyo, Japan) and Prof. Dr. Mohamed Hanafi Musa (UPM). The Chairman of the symposium, Assoc. Prof. Dr. Radziah Othman, said that the symposium opened up opportunities for all individuals such as educators, scientists, industry and agricultural entrepreneurs to share information on the issue of acidic soil. International participants included those from Canada, Slovakia, Poland, Kenya, Hungary, Sri Lanka, India, Pakistan, Bangladesh, Japan, China, Pakistan, Guam-USA, Vietnam, the Philippines, Australia and Indonesia. Agencies such as the Malaysian Cocoa Board (LKM), IADA, MADA, DOA, SALCRA, FGV and Sime Darby Plantation also participated in the symposium. Malaysia has successfully managed its acidic soil well for the purpose of crop cultivation and farming and can act as an example to other countries. The symposium was also a place for companies as well as individuals to market their equipment and products such as fertilizers. Secretariat of the symposium, Dr. Daljit Singh Karam, said the four-day symposium also included a visit to Melaka to view weathered and acidic land profiles apart from enjoying the beauty of Melaka as a historic city.